“If you don't have a suitable roof or solar access, a collectively-owned ground mount is a great way to go!" The Ten Stones community in Charlotte owned a meadow ideal for ground-mounted PV, but neither they nor the developer had any direct models for how to organize such a system. After much hard work and diligence, however, the Ten Stones Community now hosts a ground-mounted 24-kilowatt solar array that provides clean, renewable, affordable electricity to five households as well as the pumps for the community’s wetland, which pre-treats sewage. It’s estimated the project annually offsets about 20 tons of carbon. 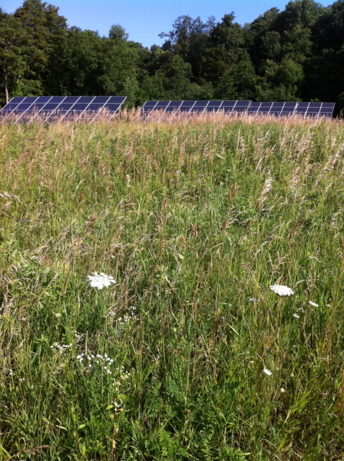 The three-row solar array is located in a meadow 1200’ from the closest electrical meter because it was the only location large enough. The installation is mostly hidden from sight, even from the road, much to the chagrin of some Ten Stones residents who are committed to celebrating and communicating the benefits of sun-powered electricity. Though only five homes and the community wetland meter receive solar credit from the project, forward-looking Ten Stones residents easily and affordably installed a fourth housing for a cable in anticipation of future interest in expanding. Like many community-scale projects, this project relied on Vermont’s group net-metering law to make it possible. “If you don't have a suitable roof or solar access, a collectively-owned ground mount is a great way to go,” Foster said, articulating the access problem net metering solves for many solar-interested Vermonters. After creating the group of interested people and deciding to give it a go, they had to figure out how to size the system and apportion the ownership. Using a year’s worth of electricity bills, individual members chose the amount of kW they wanted to own. Those sums were added together to determine the total size of the project — 24 kW. From there, the amount members’ owned was calculated as a percentage of the whole. For example, a member owning 4 kW would own 16.67 percent of the system. The percentage of ownership is crucial to all of the Collective’s transactions; it is the percentage the member paid for the system and pays for all ongoing expenses, such as insurance. It is also the percentage amount of the solar credit to which the member is entitled. Like all solar projects, homeowners use a variety of financing and funding tools to make it possible. The total system cost was $130,000, after the 25 percent discount from Alteris Renewables (which, by the start of construction, had been bought by Real Goods Solar). That cost included the 1200’ trenching, the additional housing for a cable for future expansion, electrical upgrades and all other construction incidentals. As individuals, the solar collective owners received the 30 percent federal Investment Tax Credit (ITC) on the amount they each paid for the system, as well as Vermont’s Small-Scale Renewable Energy Incentive. Solar collective members could also sell their excess power back to the grid at $0.20 cents kW (but since then that capability has been taken away by Green Mountain Power and the Public Service Board.) To pay for the upfront capital costs, most homeowners took out 0 percent 18-month EnerBank loans on their ITCs. Some took out affordable VSECU loans and others paid for their portions of the system outright. Project payback will be 10-12 years and members, like Foster, now enjoy getting their energy bills. “I haven’t paid an electric bill since May 2012!” she said. To make this both financially and legally possible, members of the Ten Stones Solar Collective had to put several pieces together to tap the tax credits and structure both the legal and financial frameworks needed for the shared system. Real Goods Solar recommended that the Collective become a Limited Liability Company (LLC), which is very easy to do online. As an LLC, the utility has one entity with which to correspond, and it has the added benefit of liability protection for the members. The Collective had to create two legal frameworks for their project. Since there was no pre-existing model, they decided to draw up the documents themselves. Over the course of long and detailed meetings, they created one document governing the operation of the Ten Stones Solar Collective, in terms of membership, voting rights, payment for and from the system, etc. The other legal document is between the Ten Stones Solar Collective and the Ten Stones Housing Association, which owns the land on which the system was built, stipulating proper uses of the land and responsibilities of the Collective to it, such as potential decommissioning issues. The Collective built off of the existing community ethic of the co-housing neighborhood and utilized group net metering to maximize efficiency and allow multiple households to share in costs and benefits. VTDigger. org - YES, In My Backyard!